Jelastic runs your code on standard industry leading software stacks such as Apache Tomcat, Nginx, GlassFish, WildFly, TomEE, mod_php, PHP-FPM, Passenger, Puma, or Unicorn. Combined with standard database server instances (dedicated instances exclusively for you) such as MariaDB, PostgreSQL, MongoDB, Neo4j, and OrientDB. Run legacy software and off the shelf frameworks without any awkward hacks or expensive code refactoring. Pull your latest code changes right from any git or svn server; but if version control isn't your thing, you can simply deploy a zip archive or war file. Deployment your way - even via SSH or FTP/FTPS! You're up and running in seconds thanks to our preconfigured servers, but you can edit all major config. files to optimise for your particular needs - php.ini, server.xml, my.cnf, httpd.conf, nginx.conf - even install your own custom modules. Jelastic constantly resizes your servers to always fit your usage perfectly like a glove. Unexpected traffic spikes are no longer a problem - your servers automatically grow to handle the extra load, and then shrink back down again to keep your costs low. Zero-touch setup. It's completely automatic, and transparent to your application and your users. No delays, no fuss, no downtime. Each environment you launch runs from our ISO27001 accredited (UK and Singapore), or SSAE-16 SOC2 audited (Arizona, USA) datacentres - choose the region for each separate Jelastic environment from the dashboard. Each environment runs exclusively from the selected region (full data sovereignty control). Each Layershift Jelastic region is backed by the latest generation enterprise grade pure SSD hardware, ready to power your applications to success. Every part of our service is backed by industry-leading SLA guarantees ensuring impeccable service quality - backups, support, uptime - it's all included in our SLAs. Our unique automatic vertical scaling feature means your server always fits your resource needs like a glove, saving up to 80% in resource costs vs. the competition. 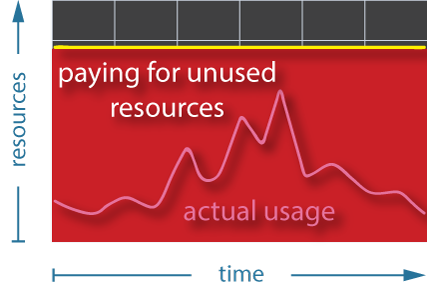 Most other providers sell servers by instance size - you're wasting money on resources you're not using, and you can never (safely) use 100% of the resources with instance size pricing; you always pay for extra headroom above your real usage. Graduated pricing, from just £3.28 per month (£0.0046 per hour). Your first 10GB (SSD) storage per environment is free. Any usage above that is charged at 5p/GB per month (0.0068p per hour). The filesystem is persistent (not ephemeral) so everything you write there is safe and survives a reboot! Internal traffic between servers within your environment is always free. The first 2GB Internet traffic every hour (approx. 1.4TB/month) is also free! Any usage above that is charged at 5p - 10p per GB (depending on volume). Public IP is £2/month (£0.00274 per hour). Your public IP is static, so it remains the same even when restarting your environment. You know when you are dealing with a well run company, and these people are as good as it gets. Well priced, helpful, highly skilled and really available 24/7/365. We chose their fully managed service which turned out to be a wise decision. We have made extensive use of their tech support team who have helped us on many occasions where others had drawn a blank. Yes, we offer a free 14-day trial to allow you to experience our innovative Jelastic PaaS. What are the trial restrictions? Public IP addresses, custom SSL, Docker, and our Elastic VPS feature are only available on paid accounts. What is a Jelastic environment? Jelastic groups your servers into environments. This is just a collection of servers all devoted to serving the same application(s) or website(s); Jelastic automatically configures links between these servers on your behalf (for example, if you have a load balancer, it's automatically configured to send traffic to the web servers within the same environment). Each server within your Jelastic environment is dedicated 100% to you - you don't share with any other customer - meaning that you always enjoy maximum performance, flexibility, and security. Can you help me to migrate my application to Jelastic? Our expert migration team can migrate any number of websites or web applications to your new Layershift Jelastic PaaS account completely free of charge! We're available 24x7 to help with any questions or problems you may have during the process. Simply contact our support team after signing up for our Jelastic PaaS and they'll help you get started! We recommend that you integrate your scripts with a specialist transactional email provider for best deliverability and operability (mail related debugging). Whilst we can't recommend a specific third party service, existing customers are using services provided by the likes of Mailjet, Mailgun, and Sendgrid - all of these offer free tiers for low volume use, and if necessary your servers can be configured to use their services as an SMTP relay (no code changes required to your scripts). If you still wish to send emails directly from your server (not recommended), sendmail is installed and available to use on all application server nodes (disabled on trial accounts for abuse reasons). You should also add a public IP (not available on trial accounts) to your node(s). If you're looking for a fully integrated service with Web, Database, Email and DNS you may want to consider our Cloud VPS range as an alternative. What resources do I pay for with Jelastic? All Jelastic costs are based on usage not allocation - meaning you pay for resources consumed, and not for requesting that resources are made available to you (how it works elsewhere). You'll be surprised how little resources you actually use to run your application. How much does a cloudlet cost? These cloudlets are automatically added and removed from your servers in real-time based on your resource demands, up to your maximum scaling limit. You only pay for Dynamic Cloudlets based on your real usage. That's exactly the point - you can't know this in advance. That's why buying resource allocations is a bad idea, and why it's much better to pay for your actual resource usage instead - by using our Jelastic PaaS (so you don't need to predict the future!). You can set a maximum scaling limit for each server in your environment. This limits the maximum amount of resources your application can use (but it may run slowly or crash if there's not enough - just like any other server), and hence also limits your costs. How much does disk space cost? We include 10GB disk space free per environment. Additional disk space costs just 5p/month per GB. How much does external / internet traffic cost? We include 2GB internet traffic free every hour (around 1.4TB per month). 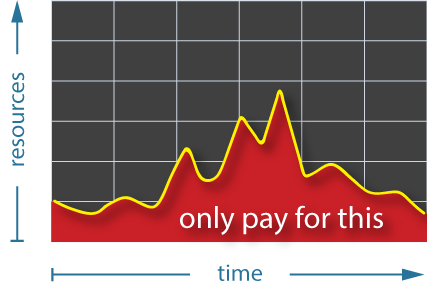 Additional traffic costs just 5-10p/month per GB, depending on volume. How much does internal traffic cost? How much are public IP addresses? £2/month per IP (you can optionally add 1 public IP per server - you usually only need 1 public IP per environment; e.g. on your load balancer or web server). Yes, you can connect to Jelastic using FTP / FTP-SSL (FTPS), but this feature is only available on paid accounts with the public IP feature enabled. Jelastic includes a highly innovative control panel which allows you to create an environment, and deploy your own multiple server infrastructure in just a few clicks. There's no control panel with the same features already out there, so this is bespoke. By default all Layershift Jelastic PaaS accounts are prepaid, so you avoid the risk of any surprise bills. Simply purchase account credits in £10 blocks or more. Usage charges are debited from your account balance on an hourly basis (in arrears). We accept all major international debit and credit cards including Visa, Mastercard, American Express and JCB. Additionally, we accept payments via PayPal (verified accounts only) and via bank transfer (payment of £100+). We have no minimum contract period. We are confident you will be completely satisfied with us, so we have no lock-in of any kind! Your prepaid account credit can be used for Jelastic services without any obligation to make any further payment. Yes, we offer a wide range of SSL certificates and can offer bundled or separate Trust Logos through our partnerships with GeoTrust, Comodo and Symantec. For more information please see this page. We invite all customers to rate every response from our technical support, billing and SSL certificate teams; our average rating for 2012 was 97.3%, 2013 it was 97.4%, and 2014 was 97.3% - our customers consistently love us! For transparency, we publish our independently-verified, real-time support rating on our testimonials page with a selection of customer testimonials. Our Global Headquarters are located in Manchester, UK. Our datacentres are located in Europe (Manchester, UK), North America (Arizona and Chicago, USA) and Asia (Singapore) and we have a Technology Centre in CEE (Cluj-Napoca, Romania). Our friendly staff are available to help you around the clock! Please let us know where you'd like to see our service next!